"Discovery and Invention in Yellowstone: 1871-1873." "About Thomas Moran." About Thomas Moran. Accessed February 15, 2013. http://www.cr.nps.gov/museum/exhibits/moran/vision.htm. "Discovery and Invention in Yellowstone: 1871-1873," American Studies at The University of Virginia, accessed February 10, 2013, http://xroads.virginia.edu/~MA96/RAILROAD/ystone.html. 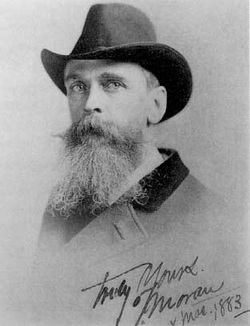 "Thomas Moran," Smithsonian American Art Museum, accessed February 25, 2013, http://americanart.si.edu/. Heather Cox. Richardson, West from Appomattox: The Reconstruction of America after the Civil War (New Haven: Yale University Press, 2007), pg. #145. "Discovery and Invention in Yellowstone."